The Gold South Parking Garage, located behind J.W. Ruby Memorial Hospital and adjacent to the Mary Babb Randolph Cancer Center, is reserved for patients and visitors, who will need a game-day pass to enter the hospital. Passes are available from WVU Medicine security officers, who will be handing them out at the parking garage. Patients and visitors can access the hospital through the Emergency Department, located near the parking garage. Patients and visitors may park in the garage beginning at 3 pm the afternoon prior to game day. All vehicles parked in the Gold South Parking Garage must be removed before 8 am on Monday. 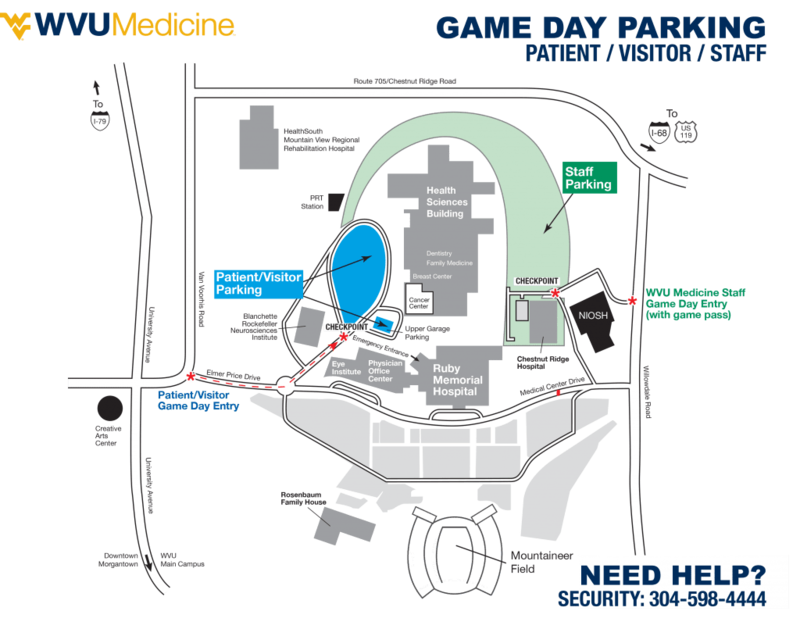 For more information about patient and visitor parking during WVU football games, please call WVU Medicine Security at 304-598-4444. Click the map to view a larger version.